The application of the laser marking machine is increasing year by year in the packaging and printing industry. The package and anti-counterfeit of tobacco, wine, medicine, cosmetics and other products cannot be separated from the laser marking machine. During the marking process of the laser marking machine, the common quality problems and their solutions are as follows. Reasons for generation: The thickness of the molded plate is not uniform, the mold pressing pressure is too small, the heating temperature is too low or the machine accuracy is not high enough. Solution: Whether the thickness of the molded plate is uniform or the mold pressing pressure is too small, or the temperature is too low, the machine accuracy is reduced checks must be run periodically to detect the actual problem. Key process control points: The thickness error of the molded plate should be controlled within 0.001mm. The hardness should be maintained at 230-280N/mm. Because the hologram consists of interference fringes pressed by a certain pressure applied by the molded roller. If the hardness of the molded plate is not enough, the internal stress will deform or damage the molded plate during embossing. 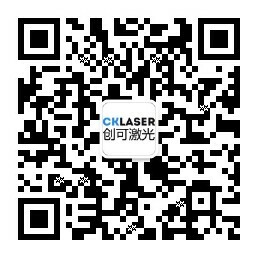 (2)The marking pattern of the laser marking machine is dim and dark. Reasons for generation: The heating temperature is generally related to the mold pressing pressure. Solution: Check whether the heating temperature is too low, and check whether the mold pressing pressure is dropped. Key process control points: The setting of the mold pressing pressure should take into consideration the type of the mold pressing temperature holographic materials or the situations of the molded plate at the softening point of the coating layer comprehensively. If the pressure is too high, the molded plate will be easily damaged or the holographic materials will be damaged due to pressing ; if the pressure is too low, the molded image will be unclear and incomplete. For circle-pressing-cycle method, the initial pressure of the pressure roller on both sides is generally around 0.08 MPa. After mold pressing starts, the pressure of the pressure roller will be slowly increased to 0.30~0.50 MPa. The mold pressing speed can be comprehensively adjusted according to the embossing quality and the machine performance. (3)The marking pattern of the laser marking machine turns white. Solution: Check whether the mold pressing speed is too slow and whether the mold pressing temperature is too high. Reasons for generation: The hot pressing temperature is higher than the degradation temperature, and the viscosity of the coating is increased, which may cause sticking on the plate so that the film may be wound on the holographic embossing roller. (5)A piece of the marking pattern of the laser marking machine is clear and another piece blur. Reasons for generation: The temperature distribution of the hot-pressing device is not uniform or the molded plate is uneven. Solution: Check whether the temperature distribution of the hot-pressing device is even and whether the molded plate is deformed or worn out. Reasons for generation: The unwinding or winding tension is controlled improperly. Solution: Adjust the unwinding tension or winding tension appropriately until the wrinkles are eliminated.